BRIGHTON, Mich. - Have you been eyeing the 2013/2014 Ford Edge, but are waiting for your current lease to expire? 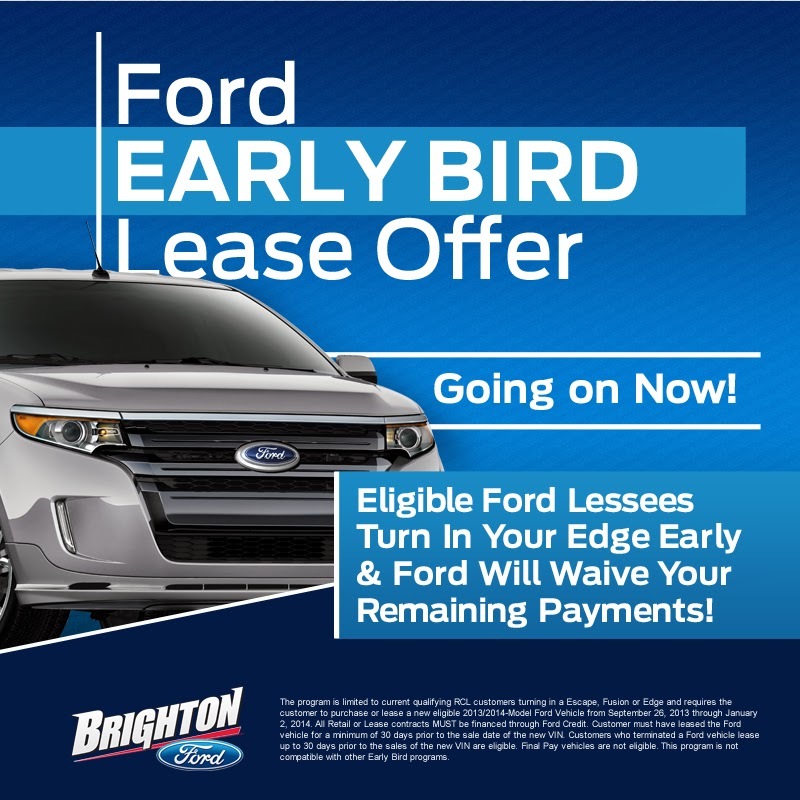 There is no need to wait because we have a great offer that will get you out of your lease early, as well as eliminate up to 5 of your remaining payments: the Ford Edge Early Bird Lease Program at Brighton Ford! The Ford Edge is a great vehicle for those that are looking for a spacious interior, sleek exterior, and technology that will make your ride comfortable and safe. All Edge drivers, tech-savvy or not, will appreciate the safety features that are optional on any of the four Edge trims. Features include a rearview camera, rear parking sensors and a Blind Spot Information System. Ford's MyKey is another option that you'll love, as it gives you the ability to set an earlier low-fuel warning light, or keep your teenage drivers from reaching speeds over 80 mph. As for the vehicle's powertrain, all Edge models except the Sport come standard with a 3.5-liter V6 that produces 285 HP and 253 lb.-ft. of torque. The EPA have estimated that this crossover gets about 19 mpg in the city and 27 mpg on the highway. As for the Sport trim, the 3.7-liter V6 engine is able to produce 305 HP and 280 lb.-ft. and gets 19 mpg in the city and 26 mpg on the highway with front-wheel drive. While knowing the specs of the 2014 Ford Edge is important information to have to consider the crossover, nothing will give you a true feel for a vehicle like a test drive. So stop by our Fowlerville Area Ford Dealer today and we'll get you behind the wheel and on the road in no time. While you're here, we'll go over all the details of how the Ford Edge Early Bird Lease Program at Brighton Ford can save you money.